Just so you know, meteorites have several names in their lifetime. The thing coming to the Earth’s atmosphere is an asteroid or meteoroid. The bright light you see zipping through the night sky is a meteor. The piece of that rock that hits the Earth is a meteorite. Something else of note: All meteorites date to about 4.6 billion years. The age of our solar system. We are now going to look at several notable meteorites. But before we do, let's see what happens to a meteor when it comes through the Earth's atmosphere. You are looking at a meteorite fragment. On the left is the outside of the meteorite (the crust) and on the right is the inside. Notice the outside is dark and smooth while the inside is more like the rocks we are familiar with. Now imagine you throw a raw hamburger on a very hot grill. You turn it over cooking both sides. You take it off the grill and take a bite. That's when you notice that the inside is still almost raw. This is what happens to meteors. They enter the Earth's atmosphere moving at such a high velocity that the friction "cooks" the outside which can then protect the inside. Now let's look at some meteorites of note. 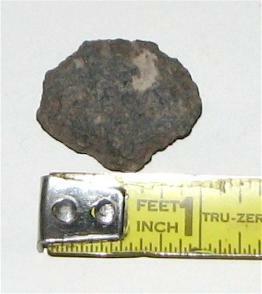 Above is the Allende meteorite. A scientist at the American Museum of Natural History has proposed that this meteorite may be older than the solar system. At one point our "Solar System" was a gaseous cloud. The thought is that a nearby star exploded and caused the gaseous cloud to collapse. The cloud collapsed and the atoms, having been pushed closer to each other, began to attract each other until the Sun and planets formed. The Allende meteorite may be a part of that star that exploded. Below is a fragment of the Orgueil meteorite which landed in France in 1864. The significance of this meteorite is that it is essentially the same composition as that of the Sun. Above is the Camel Donga meteorite which is made of basalt rock. Basalt comes from volcanic activity which means that this had to originate on some body big enough to have a volcano. The asteroid Vesta is large enough and may be the origin of the Camel Donga meteorite. The next meteorite is the most studied of all meteorites. This is a piece of a meteorite that landed in Australia. On Earth we have about 7 different amino acids. Amino acids are one of the basic building blocks of life. Scientists studying the Murchison meteorite (above) have found it contains over 82! This raises the question: Could the origins of life on Earth have been brought from outer space?